Congratulations! 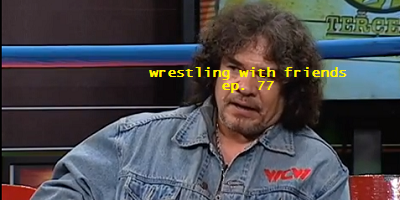 We've all made it to the 100th episode spectacular 2-year special episode of Wrestling With Friends! That's right, between these classic shows, our news editions and the one-off Fireside Chat, we've made it to a milestone. And we're doing it up in style, as we invite you all back into Heenan's Hall to decide the latest recipient of the most recognized plaque in the wrestling business! We've got Cena's squash at the hands of Brock Lesnar, the first TLC match at Summerslam 2000 and Bret Hart's most famously infamous promo of all time. And if that's not enough, we're also Stumping the Professor! We can't let him rest just because we're at the Big 1-0-0! Musical Interludes from: A Place to Bury Strangers, "In Your Heart"